When asking Cloudy what he wanted to be when he grew up, he answered " A SHEEP!" Ben was angry with Peter the other day and told him "We like mommy best because she grew us in her belly." Yeah that's right. We finally gave in and signed Ben up for soccer this year. So for the next 8 Saturdays we will be at a soccer game. Cloudy enjoys playing "baseball" too. 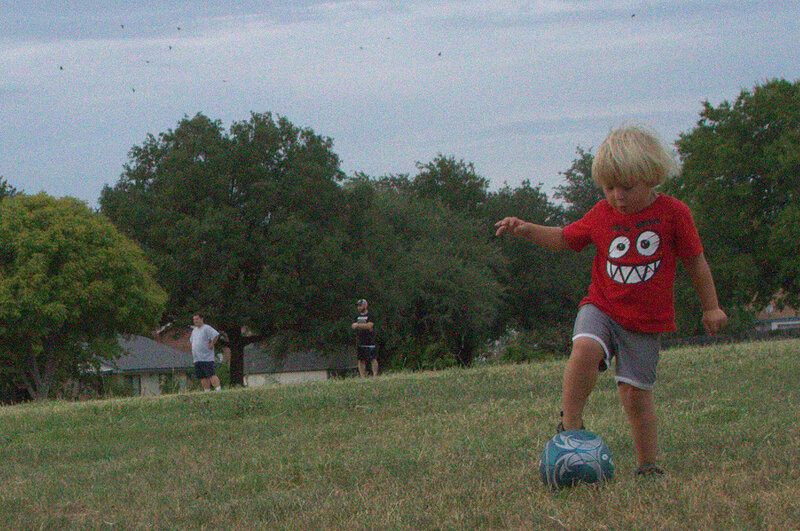 He usually plays "baseball" with the soccer ball at the soccer field during ben's soccer practice. Why he calls it baseball, i have no idea! We bought Ben some reversible shorts, gray/green and two shirts, not intending for him to wear green on green - but there he is, our little highlighter! We are so proud. Just in case you can't tell which he is, i added an arrow pointing towards him. This picture was left over from Cloudy's birthday. He has a ton of fun with his light saber. Here is a little video of what Cloudy learned to do over the summer.